Explore the advantages of investing in an electric vehicle (EV) — federal tax credits, fuel savings and easy access to charging. Federal Tax Credit : Find current information about the federal tax credit. Tax Credit for Zero Emission Motorcycles: Consumers who purchased a qualified zero emission motorcycle prior to December 31, 2016 may receive a tax credit for 10% of the purchase price up to a maximum of $2,500. Department of Energy Fuel Economy: Calculate fuel savings and compare electric vehicles side by side. Alternative Fuel Data Center Vehicle Cost Calculator and Station Locator: Explore the basics of using electricity as a vehicle fuel, charging station availability and the costs related to charging your EV. Clean Cities Plug-in Handbook for Consumers: Read a comprehensive handbook on making the switch from a conventional vehicle to an electric vehicle. Transportation & Climate Initiative: Learn about regional information as it pertains to you as a consumer, employer and/or multi-unit dweller. Department of Energy Workplace Charging Challenge: Provide information to your employer or employees on workplace charging benefits. Massachusetts Drive Clean Workplace Charging Guide: Find out how workplace charging can benefit your office and how to make it a reality where you work. Volkswagen Diesel Settlements & Environmental Mitigation: New information and updates about open grant programs funded by VW Settlement funds. EV 101: A quick guide describing electric vehicles and charging options. 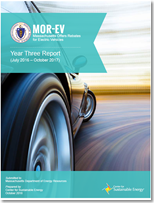 MOR-EV Program Overview: An overview of the Massachusetts state rebate program. EVSE Installation Guide for Electric Vehicle Supply Equipment: A consumer guide to understanding charging levels and safe installation. Read the Year Three Final Report to learn more about MOR-EV progress including program outreach, operations, survey results and analysis. For information on Year One and Year Two, download the Year One Final Report and Year Two Final Report. Learn more about the EV license plate — a way to showcase your unique vehicle and help emergency responders identify and safely disable your electric vehicle in case of an accident. 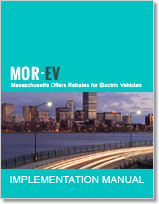 For more specific information, download a copy of the Implementation Manual, which contains detailed guidelines for the MOR-EV program.